We were all sheltered, or as some like to say, confined. Only until it came into sight and plastered our faces with it. An “oppressed” minority that supports hate came to rise, and all of a sudden demanded every space, and every conversation. Life on the ship right after the presidential elections changed. Just like when campus incidents occur, and the campus climate is affected, the climate on the ship was tense for those of us involved or affected by politics. There was division and tension. A lot of efforts were made to calm the situation, but the feelings were all out, and there was no escape for anyone. It was rough to hear the arguments and conversations. I felt like people did not really know what these elections results really meant, especially for people like me. For me it was more than just politics, it was a concern for my literal safety and well-being when returning home. My community was also in my mind, wondering how hurt and scared they may have been. I longed to be on land and have Internet service to see what was going on back home, since the only information I had were the results and of the few counter protests across the country. Trinidad and Tobago was a port I had been longing for as soon as I heard about the election results. When we got there, I was anxious to know what had been happening back home and at the same time, I wanted to get away from everyone and everything. As soon as we arrived to the ship terminal, I walked into a shop where I chatted with the workers. As soon as I mentioned I was from the U.S., they asked about Trump and our opinions. Even before election time, every port had at least one person ask us about Trump. The world is watching. 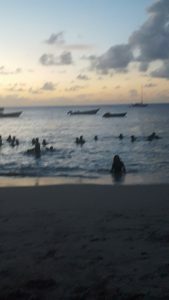 It’s a shame the ship only ported for 2 days, just enough time for me to visit a beach in Tobago, away from everyone on Semester at Sea, and get stranded there a night. I wish I would’ve had more time to spend in Paradise but we had to prepare for crossing the Panama Canal and heading off to Peru.